Robots & Rockets was designed by Sye & Tish Robertson, and published by Rule & Make Games. The game plays up to 4 players, ages 8 and up. The goal of the game is to get the most robots in your fleet. Separate Robots, Rocket, and Contract cards into individual decks. Set contract cards aside; they’ll be used at the end of the game. Shuffle both the Robot and Rocket decks. In the middle of the table, deal 4 rocket cards to create the space port. Then deal 5 Robot cards face down to each player. Place the Robot and Rocket decks above the space port. Leave room for a discard pile. 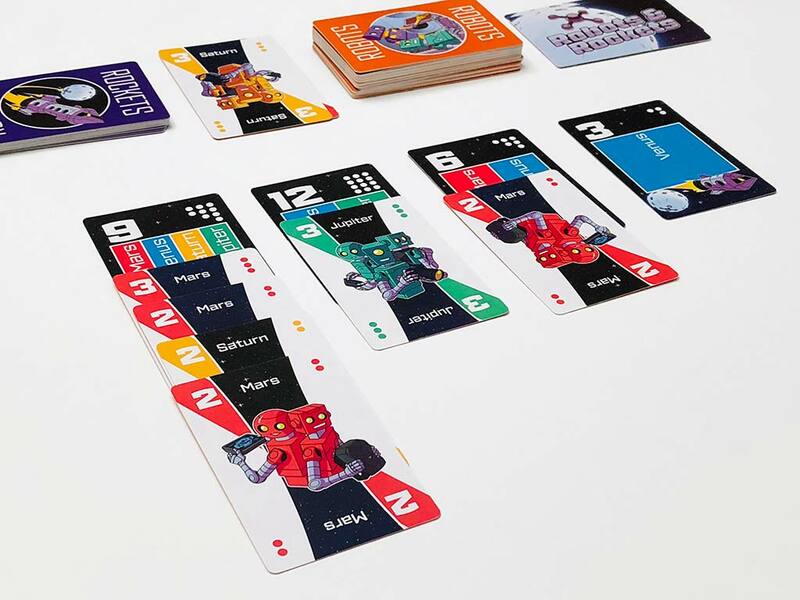 The Robot cards have robots shown with Numbers ranging 1-4 along with a destination. Rocket cards have a number which represent the seats on the ship. Destinations are the locations the ships will be traveling to: and the destinations are colored coded. Contract cards are used for scoring a single destination. There are special action cards that are shuffled with Robots. They give players special actions that help you throughout the game. Like preventing others from playing robots to a ship, taking rockets from other players, protection from stealing and transferring robots from one ship to another. Or discard a special card to draw two cards from the robot deck. Next you must play a Robot to a Rocket. Play multiple robot cards to a single rocket. Keep in mind robots must be going to the same destination. If you can’t play any robots, then you can discard any number of cards. The last step is clean up. Draw until you have 5 cards in your hand. A rocket launches when all seats are filled: immediately take the rocket and robots and place them in front of you, face down. Play continues until the last robot card from the deck is drawn. Players will continue taking turns until no one can play any cards. First, players discard any unused cards as they won’t be scored. Then count up the number of Robot and Rocket cards you have. Starting with the player with fewest cards, players select a Contract card to use. 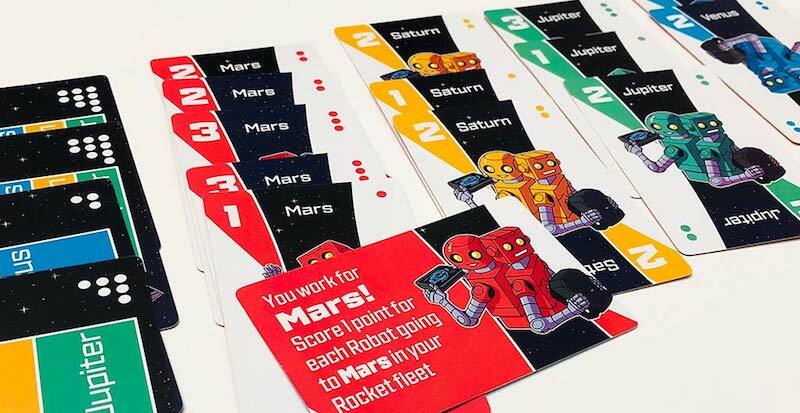 Each Contract card depicts a location: Mars, Jupiter, Venus, and Saturn. After Contract cards have been selected, players count up all robots that match the destination on their contract card. Player with the highest total wins. Izzy: I liked that the robots had different colors that matched the destination. I also liked the special action cards, like the tractor beam that lets you steal a rocket from another player. It’s neat that they used real planet names in our solar system and didn’t make up their own. Nick: I like that Robots & Rockets is simple and easy to teach. That’s how family games should be. The special action cards allows you mess with your opponents, adding a little bit of take-that. If you get lucky, they won’t have a Force shield to block your steal. Some of the Rocket cards have multiple destinations on them. Its great because you can collect a variety of Robots to help diversify for scoring. We’re really happy with the color coding on Robots & Rockets. Robots and their planetary destinations are the same color(s), making it easy to match them. We’ve played the game at two and four players. It still plays really fast at either player count. Sometimes it really comes down to luck of the draw. We’ve had two players games where one of us launched way more rockets than the other. Same thing goes for stealing, I remember one game where Izzy pretty much took everything I had. Buy Robots & Rockets for under $15, directly from Rule & Make Games. 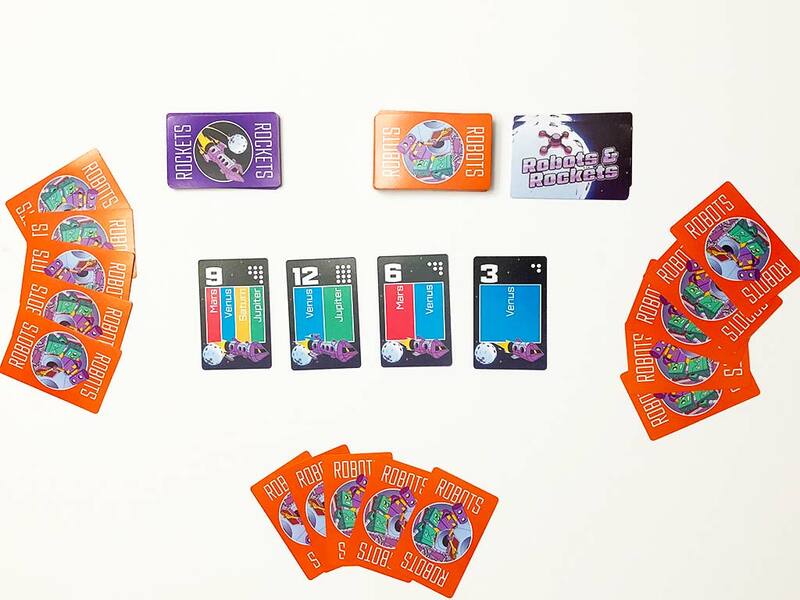 The Family Gamers received a promotional copy of Robots & Rockets from Rule & Make Games.